Oklahoma Export Crating provides packing solutions for businesses requiring domestic or international transport of their products. 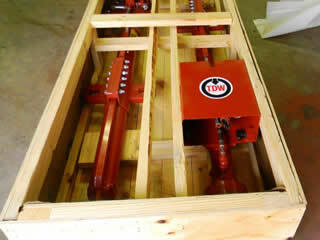 Custom crating and packing to your project specifications. Call us with your requirements and we will build it to you specific needs. 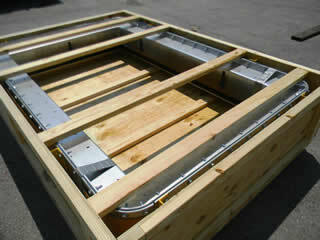 Stock rates provide a convenient and cost effective solutions for jobs that do not require a custom crating solution. We have warehouse and logistics abilites that allow you to free up space and consolidate shipments at a central location. Oklahoma Export Crating is your one-stop shop for domestic and international packing solutions! We specialize in providing secure, high quality crating services for all modes of transportation including air, truck, ocean, padded van line services. We provide custom crating of your product at our facility or we can crate on-site at your facility. We are a full service commercial packaging and shipping company with experience crating industrial equipment, medical equipment, electronics, vehicles, fragile and high value materials. We pack freight of all sizes and shapes. Contact Oklahoma Export Crating or submit an online quote request to get your shipment moving. We have great prices and personalized service to get your products where they are going. 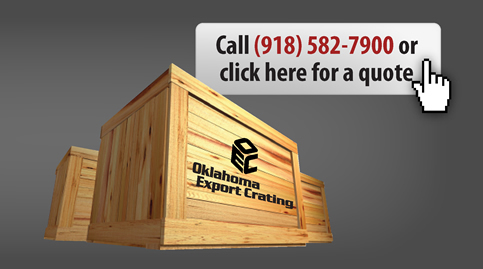 Call Oklahoma Export Crating at (918) 582-7900 to get started.